Let's just get this out of the way now; Saturday's MBGN ceremony was a mess. I just wanted to say that now, so we don't start assuming this is a piece about what was good about it, or trying to analyse what went wrong, or celebrating anything about it. No. There's no point to any of that because the whole thing was a complete fiasco. Just to recap, for any who might have missed it, on Saturday the 20th of July, the 26th edition of the Silverbird Most Beautiful Girl In Nigeria pageant was held in Yenagoa, Bayelsa state, with 18 year old Anna Ebiere Banner from Bayelsa State emerging the overall winner; and yes, the whole proceedings were, again, a mess. Where to even begin? No, seriously, where? I'm asking because I'm not even sure myself. Next there's the issue of the quality of the broadcast, although what's the point at all? I mean we've been watching these events for years with horrible picture quality which only seems to be getting horribler (yes, that isn't a word but it deserves to be just for how much it suits this issue) as time goes on. Then again, was it even the broadcast? I mean, the event was so shoddy in its organisation (or pretense that there was any such thing at all to begin with) that not even the best broadcast quality could have saved it. And when I say organisation I mean everything, right down to the ridiculous questions the girls were asked (which will shamelessly be used to back up the nonsensical claims of the pageant being about "beauty and brains" later) to how terribly they covered up their own agendas. From correcting questions on stage (I mean really?) to Miss Abuja struggling to spit out an answer that she had obviously crammed beforehand – making it even more clear how staged the whole thing was – what was Silverbird really trying to say? Yes, that is Omotola Jalade-Ekeinde being presented with the Silverbird Unique Personality Award. I'm sorry, but what the heck? Now, you know I have nothing but love for Omosexy and I believe her rosy cheeks deserve any award they get, but what in the world is a "Unique Personality Award"? Since when is a pageant an opportunity to give awards to people who aren't contesting? And, again. "Unique Personality Award"? Really? 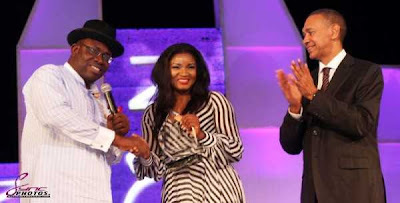 Why not just call it "The Award We Made Up To Secure Omotola's Presence at MBGN"? I'm asking too many questions. I'm tired. And I don't know why. Why should I even care? It's just a beauty pageant, after all. I mean, if I'm that upset about it, I should just go organise my own, right? I don't know. I really don't. Maybe it's the fact that it's something that's being sold to the public as a free and fair contest, regardless of how vapid the conceit of the whole thing might be. But hey, we've been watching these things for years, and next year we'll most likely watch it all again and come back with even more complaints. Let's hope next year they actually make a bit of an effort to cover up the sham. Hmm... So what do you all think? Put your thoughts in writing here. chai! ben bruz sorry u hear?